You can find a subscription box for almost anything – pets, alcohol, kids, food… and beauty. Subscription boxes have become my favorite way to discover new products. They also offer an incredible value – at least the reputable ones do. For a low monthly recurring payment, you get products curated by experts for less than they would cost separately. As the nature of this blog is finding deals on a budget, I’m starting a series for reviewing subscription boxes. 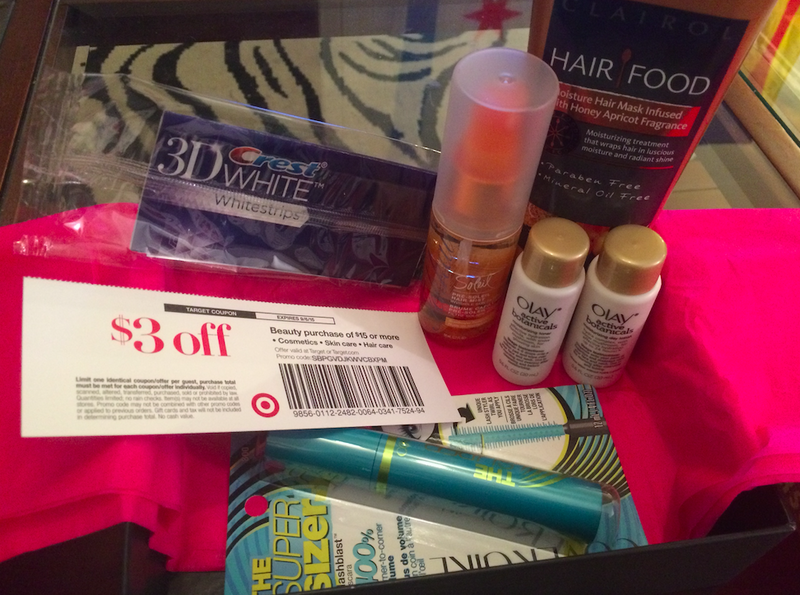 The Target Beauty Box is one of my favorite “subscription” boxes. It comes out periodically (once every few months) and can’t be bought on a subscription, but is worth keeping track of. I love that Target Beauty Boxes almost always include a full-size mascara sample, because mascara gets gross after no more than a few months. The brands they include are always top drugstore mascara brands, and this box is no exception. I actually got this same sample in a previous Target Beauty Box. It’s a nice addition to your hair care regiment for the summer, because it protects your hair for the sun. It’s light and smells fresh. I’m a big fan of hair moisturizing and deep conditioning treatments. My hair needs them at least once a week, and the results are more than worth the extra time in the shower. So I was really excited that this full-sized product was included in this Target Beauty Box! I don’t usually use many beauty products, and toner is not something that’s been a part of my routine, to date. I’m excited to try this product and see if it makes a difference! This facial lotion is so light and fresh… I honestly think I may have found my new preferred face lotion! I’ve used Crest Whitestrips in the past and they’re annoying to wear, but they really do look. I’ve been drinking a lot more tea lately, so I was glad to get this sample! What I love about Target Beauty Boxes is that they contain so much value that I actually go out and buy the items I like at full price after I’ve used them up. I can think of at least one item from each box I’ve gotten that I really loved, and several more that are fun to test out and have around, even if I don’t use them everyday. I’m not someone who usually gets excited about beauty products, but the Target Beauty Box has so many fun and useful things at an incredible price. You also get a $3 off $15 coupon to use towards any beauty purchase at Target in every box! Have you bought a Target Beauty Box? What did you think? Let us know in the comments!